The MultiStomp MS-70CDR, our versatile effect pedal with Reverb, Delay, Chorus and Dynamics effects, has just been given a firmware update. 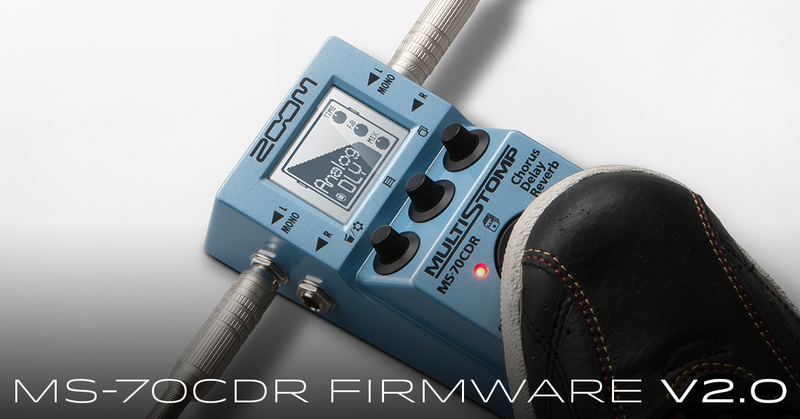 Firmware Version 2.0 offers 51 all-new effects, in addition to the 86 effects the MS-70CDR already includes. The new firmware opens up new music-making possibilities by offering guitarists classic effects like Tremolo, Slicer, Octaver, Pitch Shifter, Slow Attack, Noise Gate, Exciter, and Envelope Filter. There’s also a studio quality compressor and some advanced effects such as Lo-Fi, Synthesizer and Organ simulation. For further information of effects available on the MS-70CDR, please refer to the MS-70CDR V2.0 Effects List (PDF).